If spangly LEDs are your bag, look no further. If not, look elsewhere. What price do you put on appearance? To even consider Crucial's Ballistix Tracer 1,333MHz triple-channel DDR3 DIMMs, it needs to be high, possibly bordering on the stratospheric. This is a very pricey 6GB memory kit by any standard, but it's rated at a lowly 1,333MHz. It's also devoid of substantial cooling apparatus. Forget lush alloy fins or miniature fans. Cheapo heat spreaders are all you get. What the Ballistix Tracer does have, however, is lights. Lots and lots of pretty lights. In fact, across the top of each stick are two rows of piercingly bright blue LEDs. Powered up, they burst into action. At first, you get a slow blinking pattern with a satisfying 80s sci-fi rhythm. But wind up the workload and all hell breaks loose in the form of various high-speed patterns and sequences. It does absolutely nothing for performance, but what the hell, it's completely mesmerising. At this price point, the Crucial Ballistix Tracer 1,333MHz has its work cut out. The fancy LED light show may look great, but it does push the Tracer's pricing up and in turn its performance off-target. Running at 1,333MHz, they're actually pretty decent. 22.55GBps of raw bandwidth is certainly on the pace. Likewise, 71 frames per second in World in Conflict is as good as it gets. But then, most 6GB DDR3 kits deliver very similar numbers at that rather mundane frequency. The real performance deltas begin to appear when you begin to really crank up the clocks. 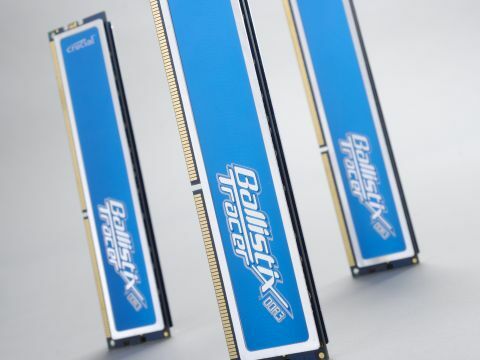 On paper, the Crucial Ballistix Tracer 1,333MHz have little in hand compared to similarly priced or cheaper 6GB triple channel kits. Nearly all, including Corsair's XMS3 2000MHz or the Kingston HyperX 1600MHz, have significantly higher official operating frequencies and many are tuned to hit even high speeds when overclcoked. By contrast, the Tracers are all about style. With that in mind, an overclocking result of 1,866MHz is actually pretty impressive. Certainly, it means this kit has enough headroom for most overclocking needs. You also get great performance in applications that feed off bandwidth, such as games. But then so does the Kingston HyperX 1,600MHz kit, and that's yours for £40 less. In that context, we're probably preaching to the converted by pointing out the cost implications of the Tracer's LED frills. If flashing lights are your bag, the Tracers will twinkle with the best of them. For everyone else, the price premium is impossible to justify.